Indigo's Mongolian Grilled Australian Lamb Chops are served with a Spanish tempranillo. Behind the dish are all five wines currently offered through Indigo's new carafe wine program. » The house red, or the house white. Take it, leave it, or order beer. » The full-on wine list, which requires you to know what you're doing or take your best guess. 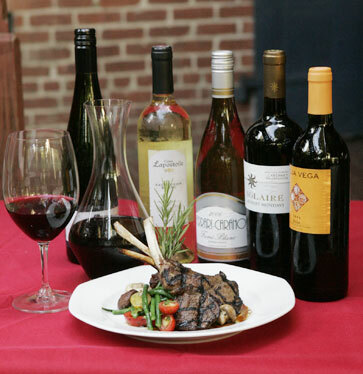 » The wine-pairing menu, in which the chef suggests a wine for each dish, removing all the guesswork. Now comes another approach, one that gives you freedom of choice, but as far as wine knowledge goes, requires only that you know what you like: a sweet white, for example, or a full-bodied red. "Retail taught me one thing: People are basically lost in wine." That's Lyle Fujioka's bottom line. The semi-retired former owner of Fujioka Wine Merchants recently updated the wine list at Indigo, introducing a carafe program that offers wines by style -- not by label or by varietal (that's the wine-geek word for type of grape). Forget about all that, Fujioka says. "The whole idea is to deflect away from getting into the label thing." Instead, at Indigo you choose by style: light, sweet white; crisp, light white; medium-bodied white; flight, fruity red; or full-bodied red. The menu tells you what type of wine goes best with what type of dish, but doesn't list specific labels. "In most places, wine service is perceived as a rip-off," Fujioka says. Customers make comparisons to wine prices they see in stores and don't account for restaurant expenses such as premium glassware or service. So he designed the Indigo menu with value in mind. A glass goes for $7, a bottle for $29 -- moderate prices for a restaurant at this level. Fujioka and the Indigo staff tasted more than 100 wines in tandem with chef Glenn Chu's dishes to select one wine for each category. Bottles are served in carafes -- the bottle is completely upended, so the wine chugs forcefully into the carafe and is quickly aerated, maximizing flavor in reds, taking the chill off whites. Guests pour for themselves at the table. Lest you think you're being served plonk disguised in a fancy Reidel carafe -- "Just taste it," Fujioka says. "If you want to see the bottle, we'll show you the bottle." For the record, order the crisp, light white and you'll get a Casa Lapostolle Sauvignon Blanc 2007 from Chile; the light, fruity red is a Rioja Vega Tempranillo 2006 from Spain. That's for now. Wines may be swapped out as vintages change, new values become available or the menu changes. "It's not just easier for guests to order, it's easier on the palate," Chu says. Kim Theos, a server at Indigo, says she's used to customers asking for "the house chardonnay." She takes that opportunity to introduce the carafe system and finds they're usually quite accepting. "I had this one guest tell me, 'I'm so happy I don't have to think about the wine list.'" Indigo is at 1121 Nuuanu Ave., downtown. Call 521-2900.